If she dies, she takes the truth with her. 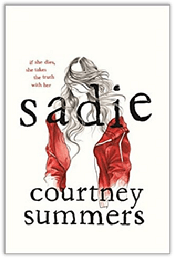 – The hook line that seems to be the focal point in advertising the upcoming YA Thriller Sadie by Courtney Summers. I initially discovered this novel through an advertisement that popped up on my Instagram feed inviting people to sign up for a free ARC (advance readers copy). I was intrigued enough from the bit of information on the book through the advertisement that I signed up. Now I’m not sure if everyone who did received a copy, but I was thrilled when a copy showed up at my PO Box just the other day. While this is Summers’ sixth novel, I personally had never heard of her before. After reading – no, correction, devouring this book though, I know I’m going to have to check out more of this Canadian author’s work. Sadie is an intense roller coaster ride that takes you through a story about a tragic upbringing, a deep loss, horrifying facts of life, and an ending that may leave you a little breathless. The story unfolds between two main points of view throughout the novel. You have West McCray, a New York based man pushed into creating a serial podcast he didn’t want in the first place. Then you have Sadie, the stuttering runaway who leaves her small nowhere American type of town on a dangerous mission. In a unique way the chapters flow between West’s podcast and Sadie’s narrative. The podcasts give you a journalistic view of research and recounting events through a colorful cast of characters that came in contact with Sadie, while West tries hard to discover the truth. Sadie’s point of view comes with tragedy, determination, and the revealing of what really happened to her since she ran away from home on a dangerous mission. Courtney Summers writes her characters in a way that you can almost hear the distinct voices as you read them. When Sadie speaks to another, it’s easy to imagine the sound of her stutter through each sentence. When West speaks it’s not difficult to imagine a more distinguished professional tone. The array of colorful characters in between these two storytellers has their own unique vibe as well. No two characters sound alike, which may seem silly to point out – but for a novel like this I find it to be important to note. Every character included in the unfolding of the story plays an intricate part and the author did fantastic giving them their individual voices. It’s claimed through advertisements that this book is the most buzzed about young adult thriller of 2018. When I first saw that I admittedly scoffed, but now that I’ve read it for myself I really could believe it to be true. Even in the most predictable circumstances of the story, I found myself surprised as a reader. All throughout the reading of Sadie I didn’t want to put it down. This was a definite page turner for me. I highly recommend those who enjoy thrillers to check this book out in September upon its release. You don’t have to be a YA fan to enjoy this book, it’s that good! If you’d like to check out this book for yourself, you can presently pre-order through Amazon and Barnes & Noble. This title officially releases on September 4th. 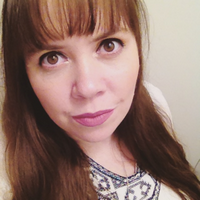 For more information on author Courtney Summers and her other works be sure to visit her website at, CourtneySummers.ca.